Vallee de Mai, green gecko and coco de mer palm. Today I went on a Mason’s Travel Excursion to Vallee de Mai, a nature park and UNESCO World Heritage Site located on the island Praslin. The park is a large palm forest with around 5.000 of the rare coco de mer. These palms have the largest seeds of any plant in the world. 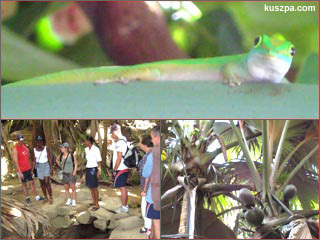 This nature reserve has also an unique wildlife with birds, mammals, crustaceans, snails and geckos.